The total investment in real estate development in the first six months of 2018 was 5,553.1 billion yuan, a nominal increase of 9.7 percent year-on-year, the growth rate decreased 0.5 percentage points over the first five months of 2018. 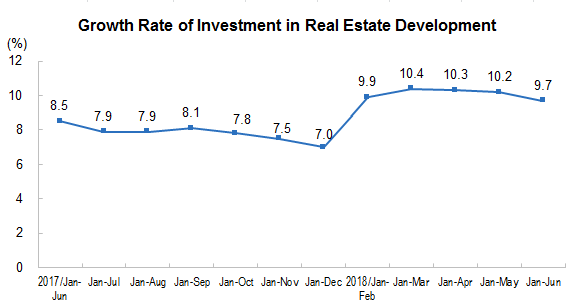 Of which, the investment in residential buildings was 3,899.0 billion yuan, up by 13.6 percent, down by 0.6 percentage points percent, accounted for 70.2 percent of real estate development investment. In the first six months, the real estate investment in eastern region stood at 3,019.4 billion yuan, up by 10.8 percent year-on-year, the growth rate decreased 0.5 percentage points over the first five months of 2018.; the central region stood at 1,183.9 billion yuan, went up by 11.4 percent, and the growth rate decreased 1.9 percentage points; western region stood at 1,145.4 billion yuan, up by 4.2 percent, up by 1.4 percentage points; northeastern region reached 204.4 billion yuan, increased 17.7 percent, down by 2.2 percentage points. In the first six months, the floor space under construction by the real estate development enterprises accounted for 7096.49 million square meters, a year-on-year increase of 2.5 percent, increased 0.5 percentage points over the first five months in 2018. Of which, the floor space of residential building construction area was 4,879.33 million square meters, up by 3.2 percent. The floor space started this year was 958.17 millions square meters, up by 11.8 percent, and the growth rate was up by 1 percentage point. The floor space of residential buildings started in the year amounted to 706.11 million square meters, up by 15.0 percent. The floor space of buildings completed stood at 371.31 million square meters, went down by 10.6 percent, and the pace of decline rate expanded 0.5 percentage points. Of which, the floor space completed of residential buildings stood at 259.62 million square meters, went down by 12.8 percent. In the first six months, the land area purchased by the real estate development enterprises totaled 110.85 million square meters, was up by 7.2 percent year-on-year, that of the first five months in 2018 was an increase of 5.1 percent. The total transaction of land reached 526.5 billion yuan, increased 20.3 percent, and the pace of growth rate went up by 4.3 percentage points. 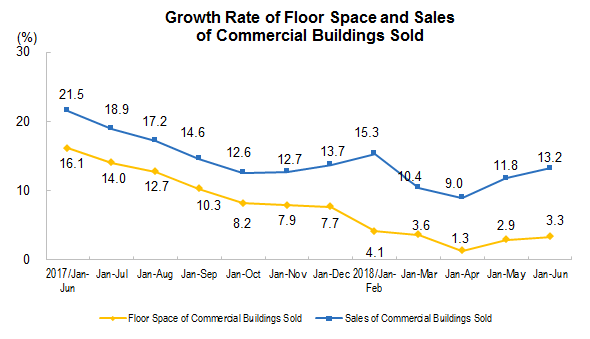 In the first six months, the floor space of commercial buildings sold stood at 771.43 million square meters, a year-on-year increase of 3.3 percent, and was up by 0.4 percentage points over the first five months in 2018. Of the total, the floor space of residential buildings increased 3.2 percent, office building decreased 6.1 percent, and buildings for business use increased 2.4 percent. The sales of commercial buildings amounted to 6,694.5 billion yuan, an increase of 13.2 percent, the rate of growth went up by 1.4 percentage points. 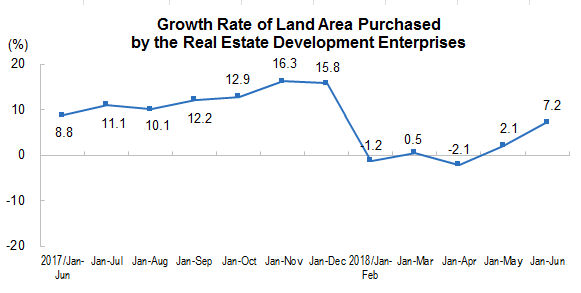 Specifically, the sales of residential buildings went up by 14.8 percent, office buildings was down by 3.2 percent, buildings for commercial business increased 5.7 percent. In the first six months, the sale of floor space of commercial buildings in eastern region amounted to 315.96 million square meters, decreased 5.4 percent year-on-year, the pace of decline rate narrowed 1.3 percentage points over the first five months in 2018. The amount of sales stood at 3603.4 billion yuan, up by 3.9 percent, the pace of decline rate was up 1.8 percentage points over the first five months in 2018. The sale of floor space of commercial buildings in central region amounted to 215.88 million square meters, increased 12.8 percent, and the pace of decrease went up by 0.5 percentage points. The amount of sales stood at 1,447.6 billion yuan, increased 27.0 percent, the rate of growth went up by 0.1 percentage point. The sale of floor space of commercial buildings in western region amounted to 206.21 million square meters, increased 10.0 percent, up by 0.1 percentage point; The amount of sales stood at 1,400.8 billion yuan, went up by 28.2 percent, the growth rate went up by 1.4 percentage points. The sale of floor space of commercial buildings in northeastern region amounted to 33.38 million square meters, downed by 1.1 percent, the growth rate went up 3.3 percentage points over the first five months of 2018. The amount of sales stood at 242.8 billion yuan, went up by 14.1 percent, the growth rate went down by 4.8 percentage points. At the end of June, the floor space of commercial housing for sale reached 550.83 million square meters, decreased 9.27 million square meters compared with that at the end of May in 2018. Of which, the residential buildings for sale decreased 6.42 million square meters, office buildings decreased 0.47 million square meters, buildings for business use went down by 1.68 million square meters. 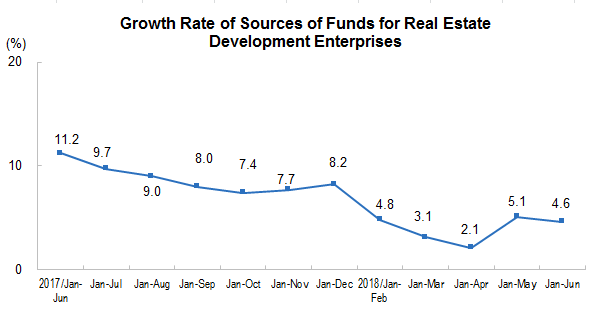 In the first six months, the sources of funds for real estate development enterprises reached 7,928.7 billion yuan, up by 4.6 percent year-on-year, decreased 0.5 percentage points over the first five months in 2018.Specifically, the domestic loans stood at 1,229.2 billion yuan, decreased 7.9 percent, foreign investment stood at 2.8 billion yuan, a decrease of 73.1 percent, self-raising funds stood at 2,554.1 billion yuan, up by 9.7 percent, deposits and advance payments totaled 2,612.3 billion yuan, increased 12.5 percent, personal mortgage loans totaled 1152.4 billion yuan, down by 4.0 percent. 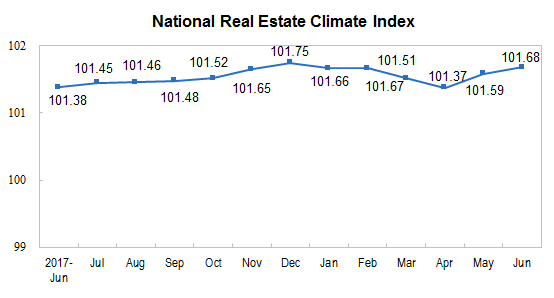 In June, the national real estate climate index (the value released from this year was after revised by the based period) was 101.68, up by 0.09 month-on-month. Floor space of buildings under construction: refers to the total floor space of all buildings by the real estate development enterprises during the reference time. Including floor space newly started in current year, floor space of continued construction of the building from the former period, floor space of stopped or postponed in the previous period but recovered in current year, floor space completed during current year, and newly started floor space in current year but postponed. Floor space under construction of multi-story buildings refers to the total floor space of all stories. Floor space of houses newly started: refers to floor space of houses newly started by the real estate development enterprises during the reference time, the unit project as the accounting object. Not including continued construction area of housing which started in the previous period, and restarted construction area in the current year but stopped or postponed in the previous period. Specific due date is subject to starts to housing officially began ground-breaking gouge (ground treatment or permanent piles). Floor space of houses newly started refers to the entire floor spaces of whole building; the calculation cannot be separated. The national real estate climate index follows the theory of economic cycle fluctuation, based on the business cycle theory and business cycle analysis, using time series, multivariate statistics, econometric analysis, taking real estate development and investment as the benchmarks, selecting related indicators such as real estate investment, capital, area, sales, excluding the impact of seasonal factors, including random factors, compiled by adopting the growth rate cycles method. The historical data will be revised monthly according to the newly added data. National real estate index selected year 2012 as the base year, and its growth rate was set at 100. Typically, the most appropriate level of national real estate climate index is 100, the moderate level is between 95 and 105, the lower level is below 95, and the higher level is above 105. Eastern region includes Beijing, Tianjin, Hebei, Shanghai, Jiangsu, Zhejiang, Fujian, Shandong, Guangdong, and Hainan. Central region includes Shanxi, Anhui, Jiangxi, Henan, Hubei, and Hunan. Western region includes Inner Mongolia, Guangxi, Chongqing, Sichuan, Guizhou, Yunnan, Tibet, Shaanxi, Gansu, Qinghai, Ningxia, and Xinjiang. Northeastern region includes Liaoning, Jilin, and Heilongjiang.